It is indisputable that after the facilities that the Cuban government has given to create private businesses and the growing tourism in Cuba, the culinary field has been forced to develop. See this development as the result of competition between each establishment, or simply because outsiders demand a high level of quality of what they consume, Cuba has become a destination where its main attractions after natural or historical sites are undoubtedly tobacco , the rum, the drinks and not least less despicable: the Creole food. Dishes such as old clothes, picadillo a la habanera or any version of seafood are the privileged ones in the proposals of any chef in the city. As offers in the bar there are drinks that are in each restaurant: mojito, free Cuba, piña colada (with or without alcohol), beers (mainly of national invoice) or wines. The offers are many: some come well recommended, others not so much. 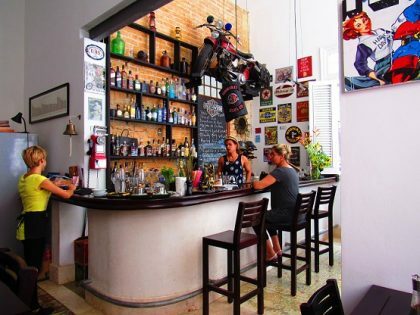 In terms of prices, Havana restaurants range from an average of 25 CUC for two guests, although it is necessary to clarify that in some places the tip of 10% of the total bill is mandatory. The so-called “tablets” can be found in some establishments; especially at lunch time. The price usually of each Tablet per person is about 10 cuc. The attention in some places is much more careful than in others. Differences can sometimes be appreciated even within an establishment. Although some have the well-deserved seal of tripadvisor. The foods are characterized by being prepared with harvests of both fruits and vegetables whose sowing has not been altered by chemical products that damage the flavor of these products for the most part. Restaurants specializing in foods such as Russian, Chinese, Indian, Mexican can be found although they are not the majority. In the case of Russian food there is the famous Nazdarovie just in front of the very same boardwalk, with a very privileged position, where You can taste delicious dishes although it may not be the cheapest place to eat in the city. As far as Chinese food is concerned, there is the circuit of the Chinese district where the client is captivated by the sea of ​​gastronomic proposals offering the menu of the house. Indian food is located right in the very Vedado, in a place called Topoly , very well prepared food and careful attention is what what is expected of the place. Finally the Mexican food, also in the Vedado in the Burrito Habanero . There is a good number of restaurants that offer both international and Creole food indistinctly. It is usual to always find a group of musicians entertaining the place with music recognized worldwide and whose author is mostly Cuban. The genre that predominates is the one called “son”. This however is not always the rule since depending on how “chick” or not the place is entertained sometimes with jazz or simply with fusion or international music. NosotrosCubaneamos shows a list of restaurants that are present in the itineraries of each tour of the Havana guides. We invite you to take a look at here and if you like it book from now! . Some of these places because their fame precedes them for the time they have, the position that favors them within the circuit to travel and others (the most important) because they have earned a position for the quality that distinguishes them.